Take advantage of a day in Paris to explore the capital with total freedom on a double-decker Big Bus. Then discover the Louvre at your own pace with a recorded commentary designed to guide you through the museum. Begin your day with an open-top bus tour of Paris. Enjoy panoramic views of the city while listening to an audio commentary in the language of your choice. Hop on at any of our Paris stops by showing your e-ticket to the driver. 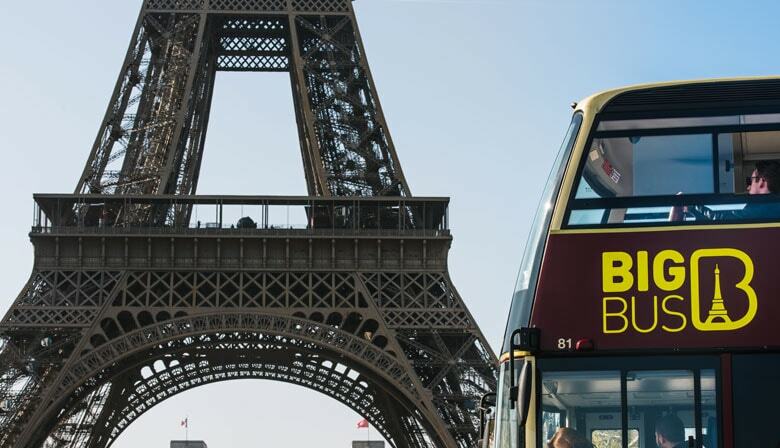 Big Bus offers two routes in Paris, allowing you to see the most famous sites of the city. The red route includes 10 stops close to the most iconic landmarks and attractions. Hop on and off as you wish to discover the city at your own pace and visit the places that appeal to you the most. For example, you can get off at l'Ile de la Cité where the Notre-Dame Cathedral sits on the impressive Place du Parvis. While strolling through the neighborhood, you will also see the Sainte Chappelle, which was built to house the Crown of Thorns of Christ's Passion, and the Conciergerie, which became a prison after having been a royal residence. Near l'Ile de la Cité you'll also find the Panthéon in the heart of the Latin Quarter and the magnificent Luxembourg Gardens which are home to the French Senate (Luxembourg Palace) and an ancient art museum. The blue route tours the Montmartre district, which is one of the bohemian neighborhoods of Paris. If you look closely you'll see the famous Moulin Rouge cabaret and the Pigalle neighborhood, a popular tourist attraction that is even more vibrant at night. You'll also be able to distinguish the impressive Basilica of Sacré-Coeur which dominates the Butte Montmartre. Depending on the schedule chosen, you'll visit the Louvre with an audio-guide provided by our agency. This interactive support will prepare you to walk through the Louvre without missing anything. At your own pace, you'll discover the great artistic masterpieces displayed in this museum, reputed to be one of the greatest museums in the world. These famous works include: the Coronation of Napoleon, the Venus de Milo, the Winged Victory of Samothrace, and of course the iconic Mona Lisa. Also featured are lesser known but equally interesting works of art. Take the time to explore the temporary exhibits which are also included in your admission ticket. You can stay as long as you wish but don't forget to return your audio-guide to our agency. After your visit, you can hop back on the Big Bus and continue your tour of Paris to the last stop. - Audio guide with recorded commentary for the Louvre Museum : a deposit of 32 euros per audioguide will be required at the agency upon the departure. You will need to return the audioguide at the agency at the end of the tour, the deposit will then be given back to you. Admire panoramic views of the city on a Paris Big Bus tour. Discover great landmarks through audio commentary in your language of choice. Free Wi-Fi on board our Big Bus coaches. Take an interactive audio-guided tour of the Louvre to ensure you don't miss anything.